The Ridgway Borough Charitable Fund, under the management of the Elk County Community Foundation (ECCF), recently awarded $18,950 in grants to eight non-profit organizations, municipalities and schools. The Ridgway Borough Charitable Fund is an endowed fund established from a gift received from the estate of Sara-Jane Stackpole. The purpose of the fund is to provide support to organizations who contribute to the quality of life of the residents of the Borough of Ridgway. An advisory committee made up of Ridgway community leaders and residents is appointed by the Board of Directors of ECCF to review grant applications and distribute grants each year. The Guardian Angel Center seeks to supplement the clothing needs of children from the Ridgway area that they serve. They received $4400. The Knights of Colunbus#1064 plans to purchase audio/visual equipment including a PA system and projector with the $2,180 that they received. This funding will allow them to grow their community events which currently include a weekly public movie night during the summer, open mic nights at the Christopher Club, etc. The Master Gardener’s program through the Penn State Extension Office is planning to establish a Ridgway Community Demonstration Garden to educate the community on the best horticulture/gardening methods and practices. With the $1500 they received they also hope to supply garden produce to those in need. Ridgway Animal Haven is building a new holding facility for the stray and abused animals in the Ridgway borough and township and will use the $2500 grant they received. The Ridgway Heritage Council is re-printing the Walking Tour of Historic Homes Brochure along with its complimenting Historic Interpretive Signs Booklet. The original printing was in 2005 with 10,300 copies printed and only 50 of them remaining at the Ridgway-Elk County Welcome Center. Their grant of $1870 will be used for this purpose. The Ridgway Free Library Association’s goal is to be able to secure enough craft supplies to offer an excellent weekly story time this fall through next spring. The $1500 will also help to fund the craft supplies, themed books, and some prizes necessary for their Summer Reading Program in 2019. This year grant application requests totaled over $63,870. Grant monies were available to fund $18,950 of these requests. The Elk County Community Foundation encourages local residents and businesses to consider making a tax-deductible donation to help grow this community-oriented fund and increase the granting dollars available each year. Donations to the Ridgway Charitable Fund can be sent in care of the Elk County Community Foundation at PO Box 934 in St. Marys. 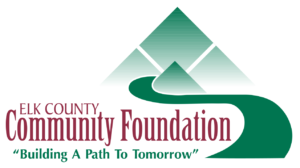 For more information, visit the Community Foundation’s new website at www.elkcountyfoundation.org or contact ECCF at 834-2125. ECCF is a non-profit organization that strives to strengthen our region through development, stewardship and grant making as it works with donors to achieve their philanthropic goals.